When young stars form they are typically surrounded by dense disks of gas and dust that eventually become the birthplace of planets. As material from the disk falls onto the star, some of the gas is channeled into highly supersonic collimated outflow known as a jet. Jets occur from a variety of objects throughout the universe, including young stars, close binary stars, and even black holes, but little is known about how these spectacular flows become collimated, how they evolve with time, and what heats the gas in the jet. The Hubble Space Telescope (HST) is well-known for producing high-quality images of the universe that show much more detail than are possible to obtain from ground-based telescopes. HST images of stellar jets are particularly spectacular, showing shock waves and internal motions in the gas. However, to learn about such fundamental properties of the gas as the temperature, density, and ionization state we must obtain a spectrum of the material at each point and analyze the relative brightnesses of the light from all the different atoms heated in the flow. Each atom produces a set of emission lines of a specific color, like a fingerprint, that allows it to be identified and studied. Employing a rarely-used technique called slitless spectroscopy, astronomers Patrick Hartigan (Rice) and Jon Morse (NASA) were able to simultaneously obtain images of each of the emission lines in the famous HH 30 stellar jet. This technique can only be used in a few special cases when the orientation of the jets is nearly perpendicular to the line of sight from the Earth, as occurs in HH 30, and has never been tried before for a large jet like HH 30 with HST. Slitless spectra generate a vast amount of information, and it took the researchers several years to analyze the data and interpret it. The results were a resounding success: for the first time it is now possible to produce actual images of the temperature, density, and ionization in a jet. The images show clearly where the jet becomes heated, and make it possible to follow how conditions in the jet vary with time. 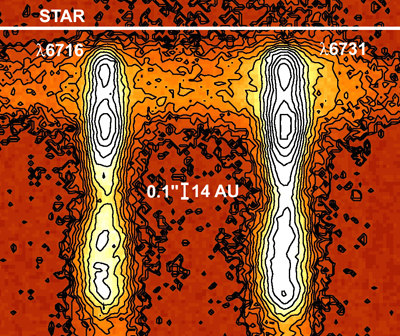 The results are a real step forward in astronomers' efforts to understand the basic processes that allow stars and planets to form. Hartigan, P., and Morse, J. Collimation, Proper Motions, and Physical; Conditions in the HH 30 Jet from HST Slitless Spectroscopy. ApJ 2007, 660: 426.